I used a picture with this saying in it a few weeks ago. 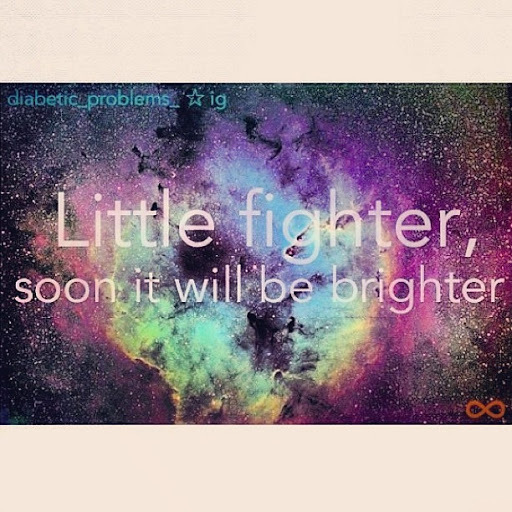 Such a simple quote, yet it’s full of meaning for my little fighter. Stinkerbell has her checkup with the diabetic doctor tomorrow. We go every 90 days. It is hard to fathom that I’ve been a parent to a T1D rock star for a little over six months. So much has happened since then! It was all so overwhelming then. And it still is- we are just getting used to the daily roller coaster ride with glucose levels. Most times her sugar is elevated….and we can live with that while we use insulin to bring it down. But days like today really keep you in check and on your toes! Needless to say, I didn’t scold her. She was able to get to the designated room to check her sugar and get a snack and recovered from the low. Normal folks should have blood glucose levels somewhere between 70 and 100. And 57 is not The lowest we’ve seen- but it’s scary, and if she doesn’t eat some fast acting carbs soon, she will continue to feel badly. She was scared today and so was I. But she knew what to do, reacted quickly, and averted a crisis. Rock Star, I tell ya! Tomorrow’s checkup is going to include talking about an insulin pump and we fear that her doctor may not consider her as a candidate for a pump. He likes to see that the patient takes care of themselves the “manual” way…fast acting insulin injections, finger pricks and slow acting insulin injections at night. That’s her schedule. All day long. There’s never a time that she ignores it- but we could do a better job with night time readings for sure. Getting a pump is a big responsibility. It gives the diabetic a continuous drip of insulin 24/7. We really want to try an omnipod. She would have a pod inserted every 3 days rather than injections 4-6 times a day. Next postInsulin Pump Therapy- here we come! I don't understand what's so bad about having a pump that is automatic versus manual (i.e. more room for human error). I thought that's what was so great about the pump. Either way, I'm sure she will do great and take it all in stride!